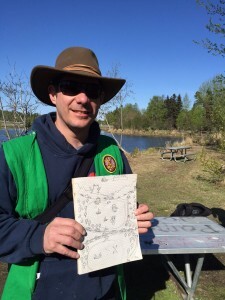 People traveling on the Chester Creek Trail in midtown Anchorage this week might notice a group wandering about in Kelly green vests and sashes adorned with a distinctive merit badge. They aren’t overgrown Girl Scouts; they’re artists who are “Seeking the Source” of the trail and it’s role in the community. “Well, um, I don’t have an opening line, but I have this odd vest with a weird patch,” says Anchorage photographer Michael Conti as he strolls down the Chester Creek Trail clutching his camera and smiling beneath his wide-brimmed hat. 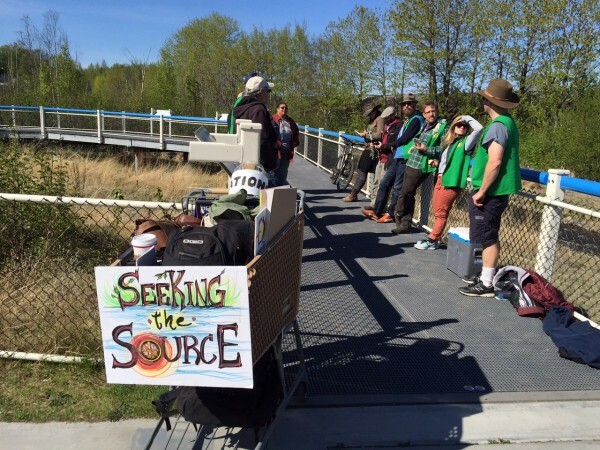 The “Seeking the Source” group meets with U.S. Fish & Wildlife. Photo: Anne Hillman/KSKA. Conti is one of eight artists participating in a nebulous thing called “Seeking the Source.” The group also includes artists who are sketching the plants that grow in the area, writers who are looking for intimate spaces, even a stilt walker who is recording stories from passersby about the trail. They’re meeting with groups and walking the trail for a week to interact with random individuals. Jimmy Riordan deboards from a canoe on Westchester Lagoon. Photo: Anne Hillman/KSKA. Jimmy Riordan is the mastermind behind it. He says he wants people to engage in the space in a new way, notice things they might ignore when traveling on a trail they’ve visited a hundred times before. He says the group is leading an expedition to discover the stories, sounds, and experiences of what the trail is today. 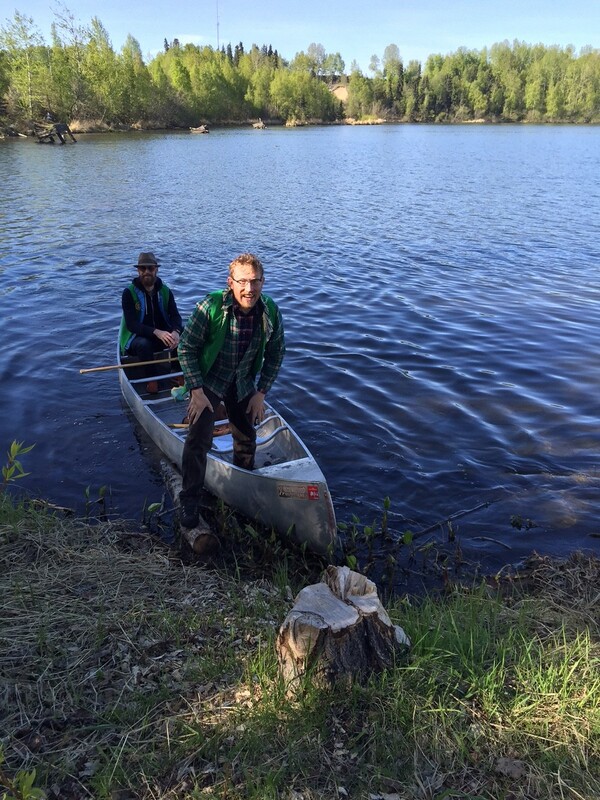 So before they set off, they consulted a map. Or rather, a room full of maps and historical documents at the city’s Parks & Rec department. “Let’s guess the decade based on the colors. 1980s? 70s…” the artists joke as they look over a vividly colored map highlight different land uses. The muni started buying land for the greenbelt in 1965, well before it was a popular thing to do. The current trail runs about 4 miles and started as a footpath. The city owns more land along the creek but hasn’t been able to develop it yet. “Dear Mr. Pitchford, it has come to our attention that a garden plot at your residence is not properly located on your property but is encroaching on the Chester Creek Greenbelt Park property,” reads artist Ayden LeRoux from a 1982 letter. Manila folders stuffed with documents show everything from property lines and drainage ditches to outdated, underfunded project proposals. Some plans for the area say the creek cannot be rehabilitated. Others highlight its potential. Riordan walks through the tunnel that runs under Minnesota Drive. He says opinions and experiences on the trail still vary from person to person. Planning this project changed his relationship with the area. He says those are the personal experiences he and his team are collecting for their website. 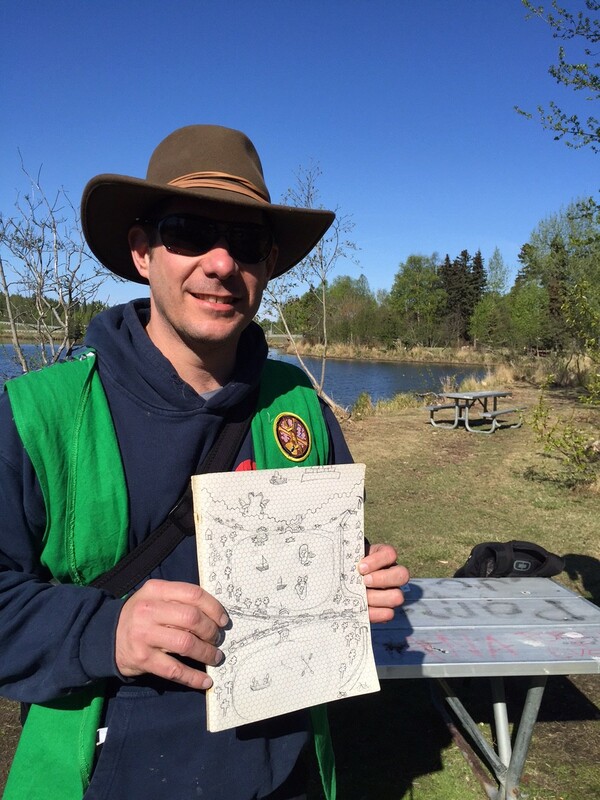 Photographer Conti is already hard at work on his map of Westchester Lagoon, sketched with child-like symbols inside a 30-year-old book of hexagonal graphing paper leftover from his teenaged role-playing days. It includes the usual landmarks and some less typical stuff. Conti’s starting to get the idea of what they’re trying to do. He’s thinking about what the trail he’s walked on for more than decade really means to him.